The Townsville STEM Hub was established in March 2017. Meeting for 2019 are to be confirmed. 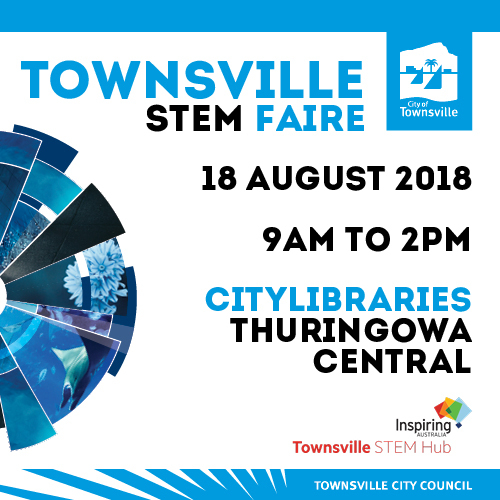 Townsville’s first STEM Faire was an amazing experience. Just under 1,700 people visited the Thuringowa Library on Saturday 18th August 2018. The science shows by internationally acclaimed science communicator Dr Graham Walker was the standout, with parents and children commenting is was the highlight of the day. The chance to play with robots, provided by Annandale Christian College and Stories Galore, and to fly a drone, provided by Townsville City Council, were also very popular. Townsville’s scientists, inventors and innovators of tomorrow were showcased via the Entrepreneurs of Tomorrow program. As well as the active programs, attendees appreciated the static displays of the Townsville STEM Photography competition award winners.